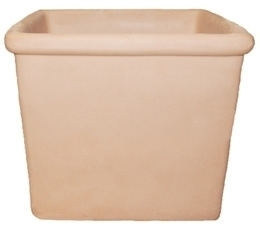 These bordato square garden planters are the perfect tapered squares. Each size of these clay garden pots has a plain side with a nice rolled rim around the opening at the top. Made using a light terracotta clay they are silky feeling and smooth. Small tabletop sizes along with larger sizes that will hold a bunch of flowers, houseplants or topiary bushes, make these a perfect choice for all your home and garden pottery needs. Square pottery made out of terracotta clay is hard to find. The corners are difficult to manufacture and they tend to have a lot of damages while firing in the hot clay kilns. So offering these nice square containers in so many sizes is out pleasure. 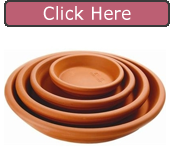 We think you will find the perfect size to serve your home and garden pottery need.